Redesigned to provide even more versatility and safety. Above and beyond its BioSafety systems, the J-26S XP has a more impact-resistant lid, full containment barrier and automatic rotor identification. Built upon standard-setting performance, including high speed, low heat output, imbalance tolerance and low noise, its vast range of separations only continues to grow. Its ergonomic design--with lower instrument height and hands-free door operation--remains unchanged. 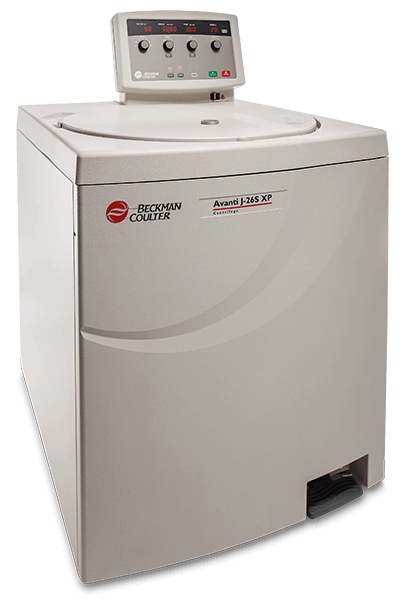 The J-265 XP can process six liters of fermentor output in less than 10 minutes, deliver a subcellular fraction at 82,000 x g and run 24 microplates at a time. It automatically detects which rotor is installed and prevents the rotor from running above its maximum-rated speed, and enables quicker, quieter, more energy-efficient runs with better temperature control. The exclusive high-torque, switched reluctance (SR) drive shortens cycle times. Three-phase filtration separates materials into solids, liquids and gasses.